"It's funny how it's the little things in life that mean the most. There's no dollar sign on a peace of mind." is pulling in my driveway on a Friday night. Which we all realize are the big things. Such a relaxing post, I felt myself unwinding. The little things ARE the big things. Isn't it sad that so many don't understand that...makes you realize how much they are missing out on. WOWZERS...that golden light is magnificent. Hope your weekend is full of simple pleasures my friend. Thanks for joining in at Song-ography. This post reminds me of the song by the Nitty Gritty Dirt Band called "Joe Knows How To Live." I'd say Adrienne knows how to live, too! Peace of mind is what we all long to have. I couldn't agree more! And this weekend, nature gave us our due from that long winter!!! I so totally agree with the little things being the BIG things. Your lighting is fabulous in the first shot and that darling little bunny is just precious. Sometimes we forget how blessed we are, those that have a home to pull up to each day and refuel for tomorrow. And Friday evenings are like the exhale at the end of a strenuous and labored exercise - that moment in the week when you can truly be carefree without guilt - after all, you have the 'whole' weekend to do all those errands and chores (or so it seems - at least for an evening). 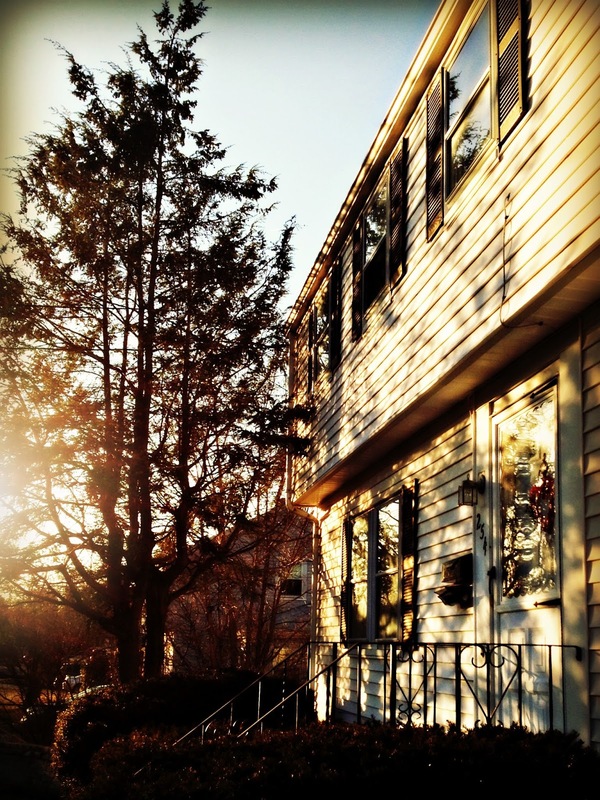 Love that evening sun on the house. I simply love this time of year, don't you? Everyone seems so much lighter and happier. Glad you had a wonderful weekend filled with the simple big things. Now, back to Monday! my feelings, your words...perfect!! we had the exact same weekend, we spent most of it home, in our little oasis. the light on that nest of yours is golden, lighting up your bunny as well. i think the bunnies were very busy over the winter....i am seeing them everywhere!!! That is a lovely shot, is that evening or morning light?